Bringing painting into three-dimensional space, Stockholder uses everyday objects as building materials, celebrating the potential for color, form, and abstraction to generate meaning in tandem with the environment and surrounding architecture. The artist’s first solo presentation in Texas in over a decade, Relational Aesthetics includes a new, painted architectural installation—which she refers to as a “situation”—that doubles as a viewing platform and pedestal. A selection of new and recent sculptures are also on view, some of which incorporate found electronic elements. Also included are other works Stockholder calls “assists”—sculptures that require support in order to stand upright. This exhibition of the work of the Chicago-based artist Jessica Stockholder (American-Canadian, born 1959 in Seattle, Washington, and raised in Vancouver, British Columbia) spans both of The Contemporary Austin’s sites, with an indoor exhibition on the first floor of the downtown Jones Center on Congress Avenue and a new outdoor sculpture commission, Save on select landscape & outdoor lighting: Song to mind uncouples, 2018, at the entryway to Laguna Gloria. 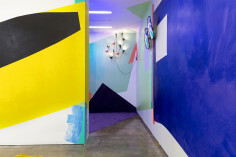 Bringing painting into three-dimensional space, Stockholder blends an interest in site-specificity with color, form, and abstraction to yield meaning. Everyday objects become building materials alongside the surrounding architecture and environment. As the artist’s first solo presentation in Texas in over a decade, Jessica Stockholder: Relational Aesthetics includes a vibrant painted architectural installation, or “situation,” that doubles as a viewing platform and pedestal, newly created for the exhibition. A selection of new and recent sculptures, some of which incorporate discarded electronic elements, as well as a group of Stockholder’s Assists—hybrid assemblages that require an interchangeable, non-architectural support in order to stand up—are also on view.